You may have medical issues making it difficult to work, or someone who needs you at home. A work-at-home job like Lionbridge may be your best option. To avoid confusion though, this review is specifically about Lionbridge Smart Crowd, not Lionbridge Technologies (which is their parent company). Smart Crowd is the division of Lionbridge that hires work-from-home freelancers. So, if you’re here to learn more about making money online, or to find out if Lionbridge Smart Crowd is scam… you’ve come to the right place. Please note, I am not an affiliate for Lionbridge Smart Crowd or Lionbridge Technologies. This review has been researched with information and testimonials that are available online in the public domain. Any conclusions drawn by myself are opinions. According to Lionbridge, they are a company committed to helping their customers master global customer enablement by bringing them the next generation of enterprise outsourcing. Customers mastering global customer enablement? I looked up global customer enablement and it turns out to be a buzz-phrase that people apply their own "loose" definition to. So, we'll skip the lingo and get right to the point. Basically, Lionbridge helps their clients improve their businesses. One way they do this is by hiring independent contractors (you) to perform various small tasks such as testing, data entry, and data research. Each task is a piece to a puzzle, and with hundreds (even thousands) of people from all over, crowdsourcing, and adding their own piece… Lionbridge can assemble them into a complete picture and use it help their clients. This is good work to do from home, but unless you're hired for one of their skilled positions, the pay isn't great and it's not always consistent. But what you're looking for here is peace of mind. If medical issues are your challenge... or if you've got young ones who need you at home, making ends meet can be stressful. Or maybe there's just no jobs in your field. Whatever your reasons for wanting to make money from home, peace of mind is what you're after and although Lionbridge may be one source of income... getting it from multiple sources online is what you need to get what you want. 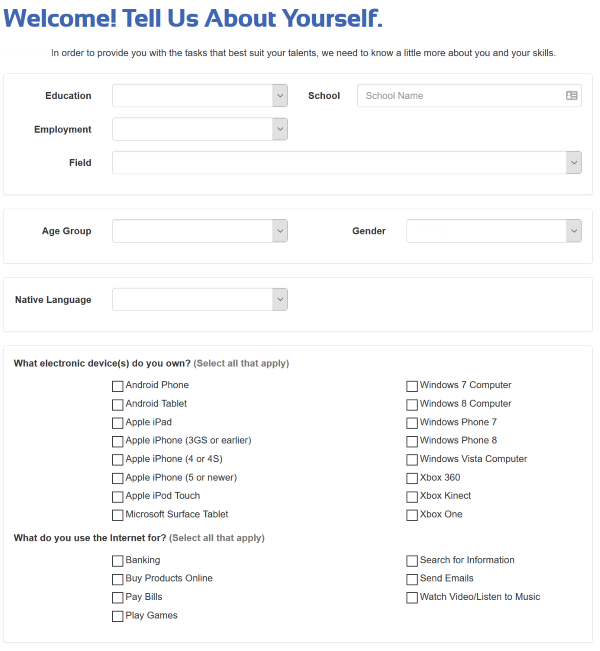 Of course, you can also earn some quick cash with surveys. Legit sites like Survey Junkie,will pay you for your opinion and others like Swagbucks pays you to do things like search the web, play games, visit websites and watch videos. When it comes to making money online it pays to be suspicious. Around every corner there’s a scam to trip over. And then, if you’ve been doing your research, you’ve probably come across a few reviewers calling Lionbridge a scam. A few that I found were viciously passionate about it. 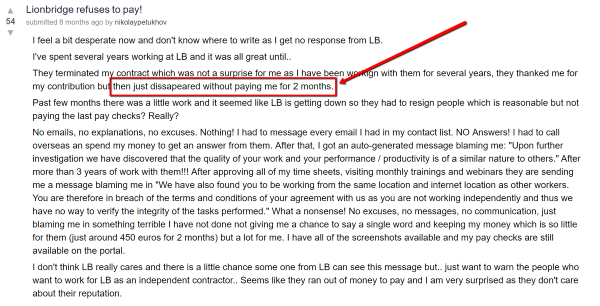 So… does that make Lionbridge a scam, or just a bad company to work for? I guess it depends on your definition of a scam? On one hand, you have these legitimate complaints. And if you’re going to sign up, do assessments, and work there… you should at least be confident they're not just wasting your time. On the other hand, Lionbridge Technologies (parent company to Lionbridge Smart Crowd as mentioned) is a publicly traded company on the Nasdaq with annual revenues that hover around half a billion dollars. They’ve also been named the largest language services provider in the world. 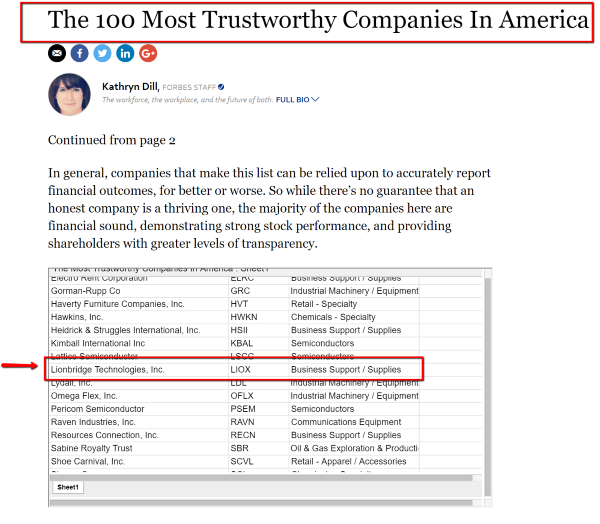 But the real nail in the scam coffin comes from Forbes… who has named Lionbridge Technologies one of the 100 Most Trustworthy Companies in America. But, I’m also in no position to question Forbes, the Nasdaq, and Lionbridge’s shareholders. I’ll go out on a limb here (a really small limb) and say Lionbridge is not a scam. A few mismanaged departments? Maybe. A mediocre employee or two? Perhaps... but not a scam. The sign-up process is what you’d expect. Give them your name, email address, etc. and wait for a confirmation link to arrive in your inbox (which might not be right away, mine took a few minutes). Once you confirm your email and get logged in, you’ll see a terms of service statement which you must agree to before you're asked to share some details about yourself. 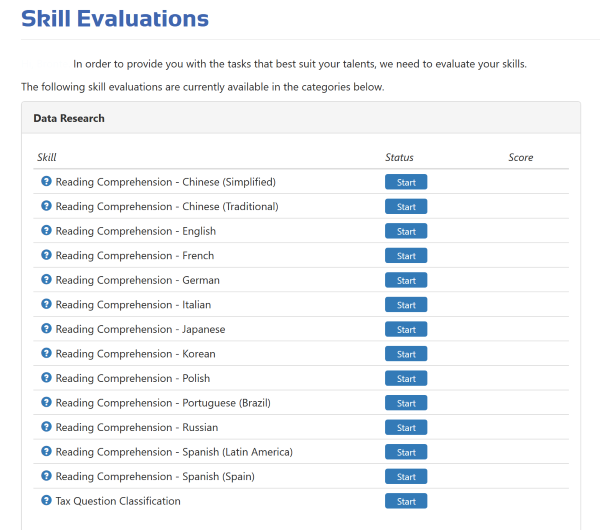 To demonstrate your “talent” you are required to complete placement evaluations, which begin with reading comprehension. Before you get crazy with evaluations though, don’t do what I did. Apparently, you can only take each evaluation once… so don’t rush through it assuming you have multiple attempts. It should be noted though, that although these are freelance positions… they are not always hiring in your area. For example… at the time of this writing, there are no open positions in the US, but they are hiring in Canada, Australia, parts of Europe,and Asia. If for some reason you don't get hired (yes, it happens to all of us) 😀 there are other opportunities to making money online. Each job title and task has it’s own pay rate. You’re paid per task, not per hour, so it’s difficult to provide a concrete answer. Generally, people have reported their pay in the $12-$14 range… but I’ve seen claims as low as $3 and as high as $36 for skilled positions such as Interpreter. Although the pay is all over the map, one thing you can count on is NOT getting consistent assignments. This is not a “fire-your-boss” type of opportunity. You can certainly make some extra money, but I wouldn’t count on it to cover your mortgage payment and groceries. The good news is that Lionbridge doesn't have to be your ONLY work-at-home gig. There are others you can use to fill up your schedule and when added together can amount to a decent income. Making money online always works best when you combine it with other methods. Even simple surveys with companies like Survey Junkie and surfing the web with Swagbucks can help. It's crazy when you start making a few bucks here and a few bucks there. Addictive almost, and a great stepping stone to starting an online business if a bigger income is what you want. Similar platforms like Appen can also provide additional sources of money, as well as usability testing sites like TryMyUI, Userfeel, and Userlytics. There are hundreds of reviews and if you sift through them you’ll get hundreds of opinions that range from it’s a great company to it’s a scam. In most cases, the negative reviews are a result of false expectations and not truly understanding that being an independent contractor requires an investment of your time (for which you won’t be paid). If you join Lionbridge with an employee approach, you’ll be disappointed. But if you go in thinking like an entrepreneur, you will be able to appreciate the benefits of freelancing. In a traditional job, you and your employer have certain commitments to each other. There’s an expectation of regular hours and earnings. Your employer expects you to show up on-time, and you expect them to give you a minimum amount of hours. As an independent contractor, Lionbridge has no commitment to you (outside of the specific task you’ve accepted) and you have no commitment to them. In other words… they can’t call you and tell you you’re late. You only work for Lionbridge when... and if... you want to work for Lionbridge. Having said that, not all of the complaints are due to an employee mindset versus an independent freelancer one. I don’t want to ignore the legitimate issues people have. For example… some have mentioned in their reviews that Lionbridge gives poor instruction. If you spend half your time trying to figure out a task, or doing it twice because they were not clear about their objective… it’s going to get frustrating really fast. But… Lionbridge has 100,000 independent contractors they work with, so some of them must do okay, and maybe when you get your rhythm, the time it takes to complete a task becomes reasonable. I guess what I’m saying is, I wouldn’t let the negative reviews stop you from joining Lionbridge. If you really want a work-at-home lifestyle, you’ll have to take some chances. If you’re looking for guarantees… it might be better to stick to a 9-5. No commitment and flexible hours. They’re not a fly-by-night company. Lionbridge has been around for over 20 years. For those who speak multiple languages the interpreter position pays well. As mentioned, I wouldn’t let the negative reviews stop you from joining, but I’d be lying if I said they were of no concern. There is an element of risk, but you’ll never know until you try. The work is unreliable, and you can’t depend on it for a regular income. Working from home is fantastic… but to be honest, testing, data entry, etc. are tedious tasks and probably not something you’ll want to do long-term. Once you get used to working from home you may want to move up to something more substantial and possibly earn a passive income. “You do what? ...and they pay you for that!?" If you’re a seasoned freelancer it can be an additional source of income. If you’re just getting started, it’s a great way to get your feet wet. What Lionbridge is not great at though, is providing a consistent income online, which you'd probably prefer. Depending on your reasons, whether it’s your health, kids, or just a bad economy... if you don’t have financial stability you'll spend far too many nights lying awake and worrying. Getting peace of mind is definitely something you want and earning income online can provide it. I've been there too... and I can tell you, it is possible. To show you what I mean I'm going to give you a free step by step beginner's guide to making money online which you can get by clicking HERE. And your search for an online income doesn't have to end there. Using your spare time with simple survey sites like surveyjunkie.com and Swagbucks is a good way to pick up a little more cash. Swagbucks will even pay you for things like watching videos and using their search engine. Of course, you can't live off of survey money, but like Lionbridge, they're a good stepping stone to making money online and even building an online business. I hope this review was helpful and to get started you can join Lionbridge Smart Crowd here. Now it’s your turn. Have you worked for Lionbridge before? Do you have other work-at-home recommendations? I am karthika from india. I have completed $19.53 [ 10/16/18 ] . But I have not received in my payment. Please Clarify my account. PayPal and thesmartcrowd mail id is same. But I have not received my payment. PayPal office is contact transaction Id number is tell me. please help me. Hi Karthika, thank you for your comment and question. I must apologize though, I’m not affiliated with either Lionbridge or Paypal. I assume you’ve tried to contact Lionbridge, my only suggestion if they are not responding to you would be to try their contact information here and see if you get in touch with them that way. Sorry I can’t be more helpful.